China announced Sunday its decision to lift retail diesel and gasoline prices for the first time in eight months, while setting up a mechanism to offer some subsidies to disadvantaged communities and public service sectors. In a circular made public Sunday, the State Development and Reform Commission, which regulates energy prices, said the producer prices of gasoline will be raised by 300 yuan (US$37.5) per ton while that of diesel oil will be up by 200 yuan per ton. To offset the impact of the price hikes to communities sensitive to higher prices, the commission said China's State Council has decided to launch a mechanism to subsidize some of the communities and public service sectors. The recipients of the subsidies include grain growers, fishermen and fishing firms operating and farming offshore or in inland areas, using oil-driven fishing boats, state-owned forestry enterprises and nurseries of forestry centers, urban public transportation firms, said the commission. It said the government will pay the unspecified amount of subsidies directly to grain growers to mitigate the impact of the price hikes of diesel oil and chemical fertilizers and other agricultural production materials. For operators of rural passenger shipping business, the commission said the government will reduce the impact mainly through such measures as adjusting the charges of transportation, and offer proper amount of subsidies to those in difficulty. The commission said local governments will offset the increased financial burden on taxi drivers in the urban areas mainly through readjusting the charges of transportation and imposing surcharge on fuel oil. It said local governments may offer provisional subsidies to taxi drivers in the urban areas if they are unable to readjust the charges in the immediate future. The Chinese Government has ordered various localities and government departments to implement the measures on subsides whileprice regulators at various levels should improve inspection and supervision of prices of processed oil to maintain the stability of the oil prices. Energy sector is one of the very few areas that Chinese Government has yet to liberalize price control since China began to build a market economy. The commission said China's current prices of processed oil are far below that on the international market, which is not helpful to oil refineries in China, to ensuring adequate supplies and to improving energy efficiencies, thus having negative impact on the stable operation of the economy. Prior to the price hikes, the retail prices of domestically processed oil is about US$43 a barrel, while that of crude oil on the international market stands at around US$60, an official with the commission said in an interview with the press. China has increased prices by about 20 percent since the start of 2005, including Sunday's move. Global crude oil prices have soared by 48 percent over that time. The artificially lower prices have resulted in heavy losses of domestic refineries and made it difficult for the oil sector to ensure domestic supplies. The central government has been slow in raising processed oil prices in the past two years to reduce the impact of higher oil prices on the disadvantaged communities and public service sectors,said the official. The official said imported oil accounts for over 40 percent of the country's oil consumption, and changing oil prices on the international market are having growing impact on domestic oil market and prices. The increase was expected by the end of this month, and a wild guess it could be as high as 20 percent lifted shares in Sinopec Corp, Asia's top refiner, and PetroChina. "It's hard to believe that this is it, after all the speculation," said David Hurd, oil analyst at Deutsche Bank in Hong Kong. "The stock market is going to be disappointed." Shares in Sinopec, which suffers more from low domestic fuel prices as it imports most of its crude, rallied 4.4 percent last week while PetroChina stocks climbed 5.2 percent. 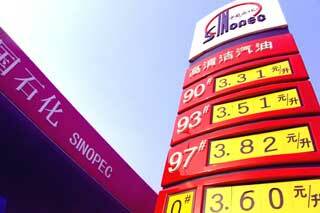 Beijing handed Sinopec $1.2 billion subsidy last year to make up for its huge losses. PetroChina said last week that it lost 19.8 billion yuan ($2.5 billion) on refining and fuel sales in 2005. Some stock market analysts have said they had expected broader reforms to align pump rates more closely with global crude costs and allow the rates to fluctuate more freely. A bolder plan to allow more frequent price changes in bigger steps may have been held back by the thorny issue of how to shield lower-income users, mostly the country's 800 million peasants, against rising fuel costs. The government has pledged to use pricing and tax measures to curb consumption, but is also committed to boosting rural incomes, analysts said.